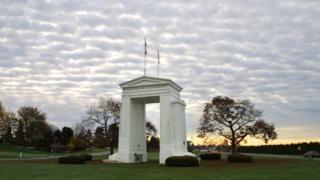 Image caption The Peace Arch US-Canada border crossing is just a short distance from Smuggler's Inn. The owner of a border town bed-and-breakfast named "Smuggler's Inn" is facing charges related to helping people slip into Canada. Canadian officials have filed 21 charges against inn owner Robert Joseph Boule, including two counts of "organising illegal entry into Canada". The Smuggler's Inn sits right on the border in Blaine, Washington, just across from Surrey, British Columbia. The alleged offenses occurred between May 2018 and March 2019. Aside from two charges related to organising illegal entry, Mr Boule faces a series of charges related to breaches of court orders. There were also several counts under Canada's Immigration Act. He is in custody in Canada and had a court hearing in Surrey on Wednesday morning, according to British Columbia court records. The inn owner is a prominent member of the Blaine community, and the cheekily named property has been covered by regional media in the past due to its proximity to the Canada-US border. In fact, the border line runs in part across the inn's grounds. In 2017, Mr Boule told the Seattle Times that he knows people cross illegally nearby, though he assured the newspaper he does not help anyone to do so. "There are people here in the evening that aren't here in the morning," he said. In 2010, in a Canadian Geographic magazine story about the Smuggler's Inn, he gave the journalist night-vision goggles to spot late-night border crossing attempts. "We see people in our yard almost every night. Just keep your eyes open," he said. Canada and America have the longest shared and undefended border in the world though the boundary is closely monitored between border crossings. Over the past two years, thousands of people have crossed illegally into Canada from the US for the purpose of making an asylum claim. The vast majority have crossed into the province of Quebec, where Canadian authorities have set up a makeshift processing centre at the border, but the trend has also been seen in Manitoba and British Columbia.